3. Results of the Coggins test take approximately 5 business days. You can rush a Coggins test and have results by the next business day but a “rush fee” is added by the laboratory responsible for running the Coggins test. 4. Coggins tests are good for 6 months. 5. In order to travel from state to state you must have in addition to the Coggins test a health certificate or horse passport (the type of document depends on where you will be traveling to). These documents are good for 30 days and 6 months respectively. Equine Infectious Anemia (EIA) is a viral infection that manifests itself in one of three clinical syndromes: acute infection, chronic infection, or inapparent carrier. Acutely infected horses show fever, lethargy, and anorexia as well as the hematologic abnormalities of thrombocytopenia and potentially anemia within 30 days of exposure. Horses that are chronically infected have the classic signs of recurrent fever, weight loss, ventral edema, and anemia. Diagnosis of EIA is either by the more popular Coggins Test or by the C-ELISA test. During the acute phase diagnosis is difficult as most horses due not seroconvert until 40 days after infection. Most EIA seropositive horses are clinically normal and never show any recognizable clinical signs. While these horses are inapparent carriers of the virus they remain infected for life with circulating infectious virus in their blood and remain a threat to other horses for the rest of their lives. The above reasons are why testing is so important. 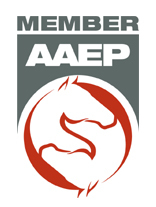 Horses testing positive for EIA must be quarantined, euthanized, or transported to a recognized research laboratory. Transmission of EIA occurs primarily by transmission from feeding insects such as horseflies and deerflies. However EIA can also be transmitted with blood product transfusion and previously used or improperly sterilized needles, surgical instruments, dental equipment, or any other blood contaminated materials. The virus is and can be transmitted across the placenta to infect foals. No specific antiviral therapy for EIA is available at this time. Horses that are infected are prohibited from interstate travel unless going back to the farm of origin (these horses must be under strict quarantine), going to slaughter, or to a diagnostic laboratory or approved research facility. 1. Require a negative EIA test as part of every prepurchase examination. 2. Require all new arrivals on a farm to have documentation of a recent negative EIA test, and test all horses on the farm yearly. 4. Encourage all events involving the congregation of horses to require documentation of a recent negative EIA test. · For interstate transit a Coggins test must be performed within the last 6 months and be negative. Coggins testing is recommended especially if you are in a boarding facility or frequent different shows around the state and country. · Health Certificate: In order to obtain a health certificate you must have a negative Coggins test within the last 6 months and veterinary check of health. Certificate good for 30 days after examination. After that 30 day period a new health certificate must be administered by a veterinarian for further state to state travel. (Note: Not all states are the same. Some states require health certificates for within state travel as well as out of state travel so be sure to check with authorities in any state you are traveling in). · Horse Passport: The Washington Horse Passport is good for travel within California, Idaho, Montana, Nevada, Oregon, and Washington. Individual trips cannot exceed 90 days. Horse Passports are valid for a six month period from the date the blood was drawn for the EIA test. In order to run a Coggins test on your horse you need to allocate at least 5 business days in advance.